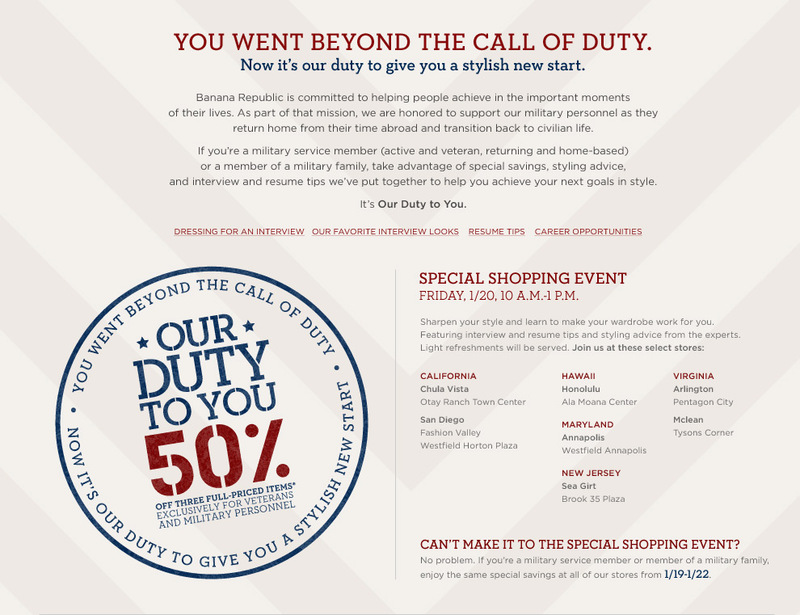 Banana Republic has launched a new cause marketing campaign focused on helping military personnel prepare for their next professional opportunity called “Our Duty to You”. From January 19-22, Banana Republic will offer military personnel and their families 50 percent off three full-priced items and a 15% discount for the remainder of the year. The campaign also features a microsite where military personnel can find helpful tips and job postings from Gap Inc. A January 20th in-store event provides attendees with useful interviewing and resume writing tips from Banana Republic HR specialists as well as workplace wardrobe tips from trained Banana Republic stylists. This effort is part of Banana Republic's ONE+ALL initiative focused on providing opportunities to employees to participate in skills-based volunteering. This particular campaign focuses on two of the hottest causes: military personnel and workforce development. Including stories from the field highlighting individuals who participate in this program (employees or military personnel) would make this campaign all the more compelling.